Encourage your kid to play with their food! 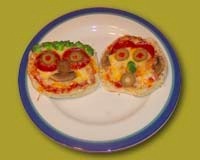 This portrait pizzas are a great alternative to delivery. Arrange muffin halves on a plate or platter. Put the platter on your party table. Pour the sauce and cheese into separate bowls. Insert spoons in each and lay them on your party table. During the party, give each guest half an english muffin on a plate. Here's a tip to share: use cheese as "glue" to make multiple toppings stick together. Let them cool on the pan for a bit before giving pizzas back to their owners for eating. Note: We used pepperoni, green olives, mushrooms, and broccoli florets. It's a good idea to check with your guests' parents regarding any possible food allergies prior to deciding on a party menu.